Your customers engage with your brand differently at different times of day and across different devices. Effective digital campaigns employ multiple channels to increase the likeliness of engagement, but that adds complexity to every marketing organization. 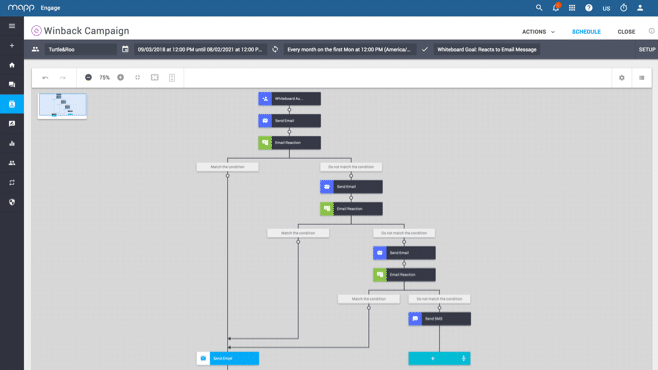 Mapp Digital simplifies cross-channel marketing by enabling marketers to build and manage email, social, web, and email marketing campaigns from one single platform. 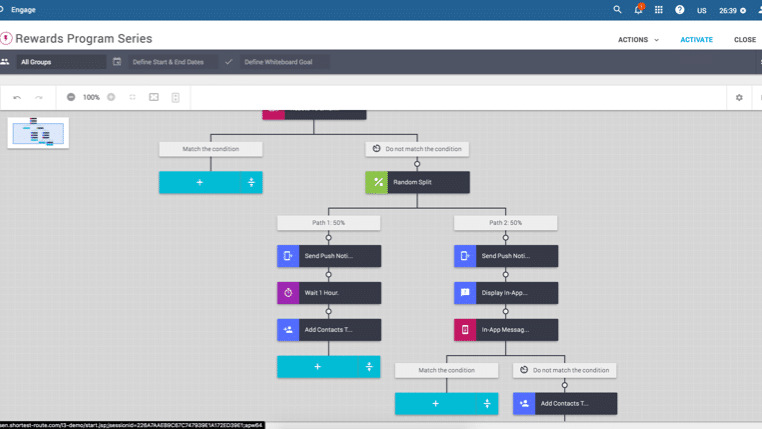 With Mapp’s newly enhanced Whiteboard, marketers can design, schedule, and automate cross-channel campaigns for their unique customer journeys. Seems easy enough, right? The reality is most marketers are managing multiple contracts with multiple vendors to run their cross-channel campaigns. 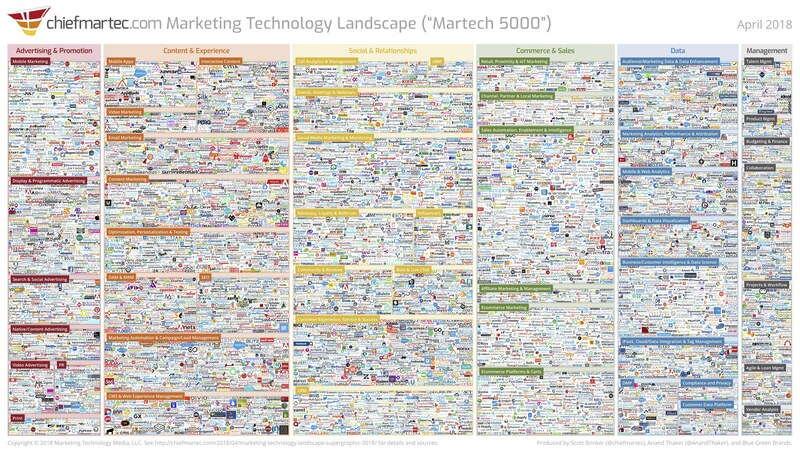 Many of you have seen this eye-sore super-graphic before, but to recap, there are over 5,000 recognized marketing tech vendors by Chief Martech. How many do you use? Using multiple vendors poses some challenges. It is hard to visualize your cross-channel campaigns, data is siloed and hard to integrate in real-time, there are cost inefficiencies, and testing campaign performance is difficult to manage. Mapp Digital alleviates those challenges! Within Mapp Engage, lives the Campaign Whiteboard. The Whiteboard is a powerful tool that allows marketers to design, automate, expand the reach, test and optimize their cross-channel campaigns in one single platform. 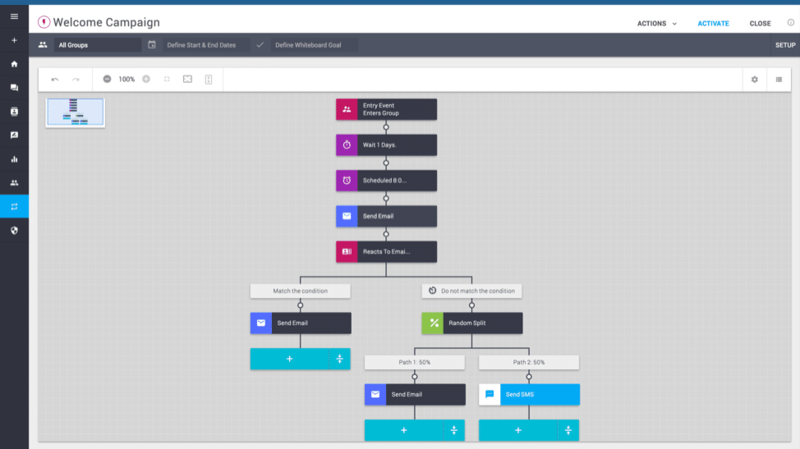 DESIGN With Mapp’s Whiteboard, you can design, build and visualize across all your digital marketing channels. Campaigns are created as easily as building Lego blocks. 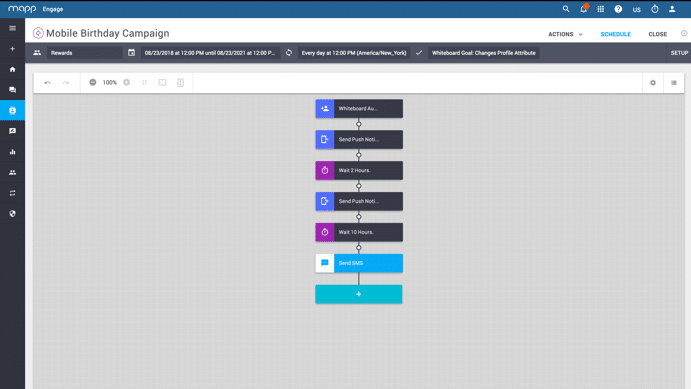 You can now build campaigns to guide each customer’s journey and visualize the campaign in one intuitive interface. The cross-channel strategy of your campaigns is easily conceptualized in the Whiteboard interface. 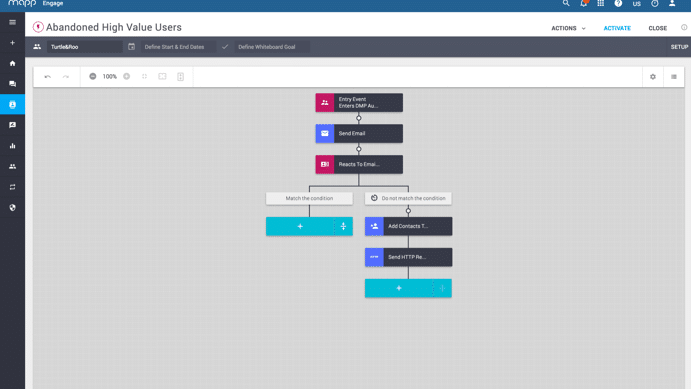 Mapp’s Whiteboard also allows you to automate your campaigns based on specific schedules, customer profile attributes, recurring campaigns and behavioral events. You can now easily reach your customers with numerous digital touchpoints! Let’s say you want to create a specific message for your customers who put a high value item in their cart and then abandoned it. The Mapp Whiteboard has built-in automation that will trigger a message to that particular customer in this type of event. Another example would be a personal message to your customers, on their birthday. You can send a birthday message and offer unique for that person. This is a great way to increase customer loyalty and engagement with you brand. 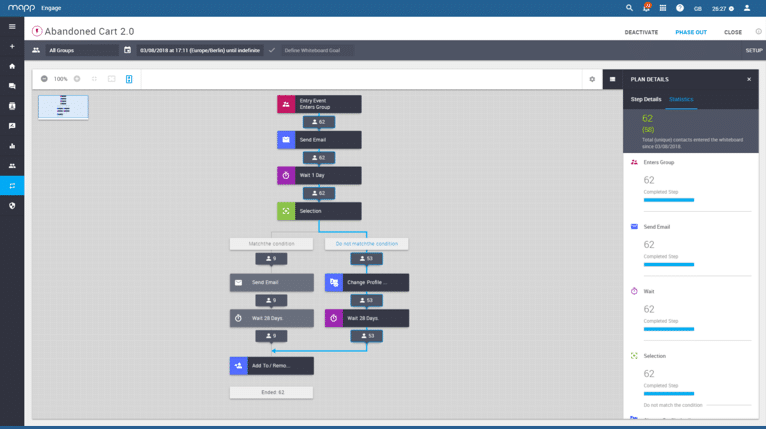 EXPANDMapp’s Whiteboard also allows you to create a truly cross-channel campaign within one simple interface. You can reach your customers with email, mobile push notification, sms, in-app notifications, and across the web. This helps guide your customer through their buying journey, increasing engagement and conversions. TEST Testing different campaign variables is easy in Mapp’s Whiteboard. You can test multiple variants, segments, random splits, and known attributes. Using the Whiteboard, you can set up tests across your entire cross-channel digital campaign in one easy to use interface. OPTIMIZE Being a data-driven marketer means you love analyzing campaign results, right (insert smile wink face)? Knowing that data analysis is NOT necessarily the fun part of marketing, Mapp’s Campaign Whiteboard shows the real-time statistics of your customers as they move through each step of the campaign. This will enable you to optimize your campaigns, increasing effectiveness and ROI.